When Toronto entrepreneurs Rose Chang and Stephanie Drabik heard about the alleged copying of designs by illustrator Tuesday Bassen by fast-fashion retailer Zara, they were appalled. They didn’t realize at the time that they were victims of theft as well. 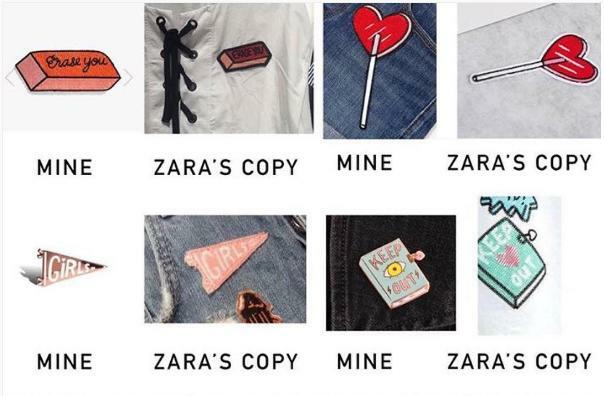 Bassen posted to her Instagram account earlier this week with photos of her own designs for enamel pins and patches side-by-side with similar versions from Zara, a Europe-based fast-fashion retailer. Zara had responded to Bassen’s lawyer saying that because of the difference in the size of the two companies viewers of their products would be unlikely to associate them with her original designs. Inditex, the company that owns Zara, said in a statement Thursday that the company has opened an investigation and suspended the sale of the items in question while they work with Bassen’s lawyers to resolve the situation. But Bassen’s situation is not unique. Since her initial Instagram post, several other independent designers have come forward with their own allegations of trademark violation and copyright infringement by large-scale retailers. And in recent years other small companies have had similar complaints. Olivia Mew discovered theft of one design for Stay Home Club, of which she is president and creative director, thanks to an observant customer who tweeted a photo of the item after spotting it in a River Island store in the UK. Small-scale copyright infringement is unfortunately nothing new for her company or for many others like hers, Mew tells Yahoo Canada Style. Small cases by individuals are generally easy to deal with: emailing the website in question with a takedown notice will generally result in its quick removal, Mew says. But it’s more difficult, time consuming, and expensive to go up against a large retailer even if the legal principles are the same. Crywolf has had designs copied by other large retailers like Urban Outfitters and Forever 21, they say, and the process seemed equally daunting in those cases as well. Big retailers take advantage of the upper hand they have in this situation, Change and Drabik say. And Stay Home Club’s experience with River Island is also not their first time dealing with design theft from a company of that size, Mew says. European retailer Berksha, which is owned by the same corporate group as Zara, used their trademarked company name on sweatshirts. 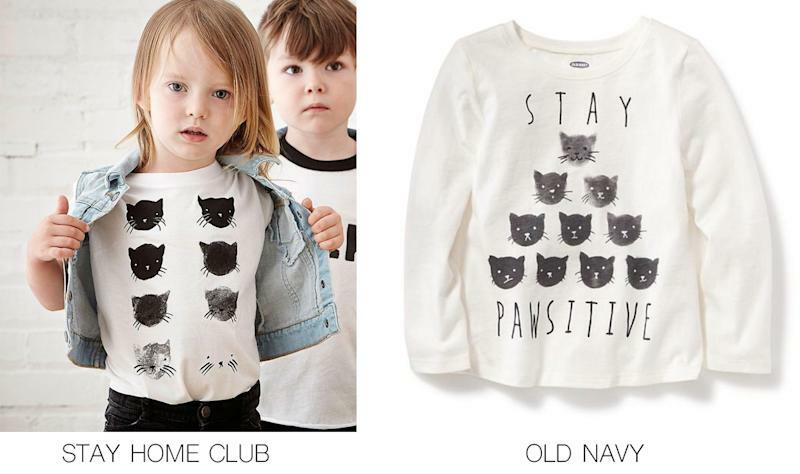 American retailer Old Navy sold a child’s tshirt that Mew says was clearly “heavily influenced” by her company’s design. And clothing with redrawn versions of their trademarked logo have been reported by customers in Brazil and Russia. The problem is widespread for independent companies, Mew says. She knows Bassen, though they haven’t spoken this week, and they’ve emailed each other about copies of their designs in the past. And she’s talked about her experience with larger retailers with the owners of other companies who say they’ve also had designs stolen including No Fun Press (by Forever 21), Adam J. Kurtz (by Zara), Explorer’s Press (by Pull and Bear, a Zara subsidiary), and Datter (by TopMan). In the last case, Kaye Blegvad of Datter did pursue a case with TopMan. The company removed the item from stores but didn’t admit any wrongdoing or provide compensation. Mew didn’t pursue any of these cases legally because the long process required to own their copyright isn’t yet complete. And the complexities of fashion law make it harder to know what the options are when designs are copied. Canadian Fashion Law provides advice on the complexities to designers, but things can get expensive when a lawyer is required to determine if a case is warranted. There is a legal difference between when an idea is copied–which is frustrating for the designer but not illegal–and when artwork–which has inherent copyright–is reproduced. Original illustrations are subject to copyright as soon as they are created, The Fashion Law reported, and the legal threshold for originality is low. The blurry line between copying and inspiration can make it hard to know when something is truly a legal violation, Chang and Drabik say. “Copyright laws seem to reflect that blurred line and it’s hard for artists and small brands to protect themselves,” they say. Mew says she’s not an expert in fashion law but she still finds that distinction easy to spot. “When you’ve created an image it’s impossible to look at a knockoff and not know right away whether it was an innocent product of ‘collective consciousness’ or whether the person redrawing it was staring at your piece while they made it,” Mew says. In the case of the patch on the River Island t-shirt, she says, the similarities in composition, colour scheme, and typeface to her company’s patch are obvious. The upside may be that building a community of creators amplifies their voices when allegations of design theft come out. Chang and Drabik heard about theft of their design from another designer. Several other entrepreneurs have spoken in defence of Bassen and others who have had work copied by large retailers, and helped bring attention to the stories. And Chang and Drabik of Crywolf say they’ve been advised to work with other artists if they pursue a claim, which may add strength to any complaint they make if they choose that strategy. What do you think of this story? Let us know by tweeting to @YahooStyleCA.